The General Business system is powered by the latest 64bit Intel 8th generation Coffee Lake micro-processor architecture. 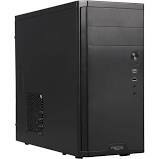 This system features an Intel Core i3 processor but can be upgraded to a Core i5 or Core i7 CPU. This system will support up to 32GB of RAM and while onboard graphics comes standard, it can be upgraded to a higher quality graphics card. This system is built for stability and dependability and is a great all-around desktop with many options and lots of upgrade possibilities for the future.